So, we tested just three voice assistants and there're a few dozens in the Android market alone. And we obviously haven't covered all the smart platforms. These are arguably the biggest names but every OS is developing and refining its own solution. BlackBerry has one and so does Windows Phone, and makers are all making a big deal about them. If nothing else, it's a promise that they will stick around and will only be getting better. And by the latter we don't mean that amazing experiences are around the corner - rather acknowledging the fact that there's quite a lot to improve. Language and market support are still limited, for one, and the voice recognition software isn't up to speed with spoken language (although rapid advancements are made there). Voice assistants are still at a stage when they cannot possibly tip the scales in favor of one platform or the other. We don't think they will be able to influence the purchase of a smartphone any time soon. And it's not just due to the fact that one of the contestants is available on all major platforms already. And yet, we thought it might be helpful to track progress. 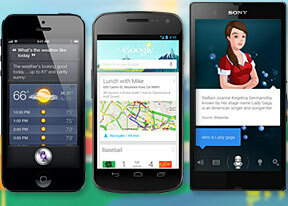 There're many iPhone and Android users who have never used Siri or Google Now. Not so much because their language isn't supported but because the whole concept may've seemed alien to them. And it definitely wasn't our goal to pick a winner. We can say though what we liked about each. To us Siri is the closest to having a personality, Speaktoit is the easiest to teach stuff and Google Now is obviously the best at finding content that's relevant to you. None of them will take charge of your phone just yet but they can all open apps, convert voice to text, search the web and help you manage your calendar among other things. There's more advanced stuff too like suggesting upcoming events around your location, shipment tracking and navigation. To a certain point, virtual assistants can be trusted to get things done. It's getting things done in a refined and sophisticated fashion that still eludes them. But wait a minute, are we forgetting something here? It's software after all. Maybe we're too used to being impressed with visuals and features, and want to be equally amazed by quirks, nuances and subtleties typical of human behavior. Oh well, a virtual personal assistant to talk to, rather than talk at, is a long, long way down the road. Yet, if growing a sense of humor and irony is a legitimate next step, we must be ready to handle it. It seems there's a fairly easy way to make robots look more human, without being too bright. How about teaching them chatspeak?